It’s so simple, it’s silly. It’s so scrumptious, it’s sinful. 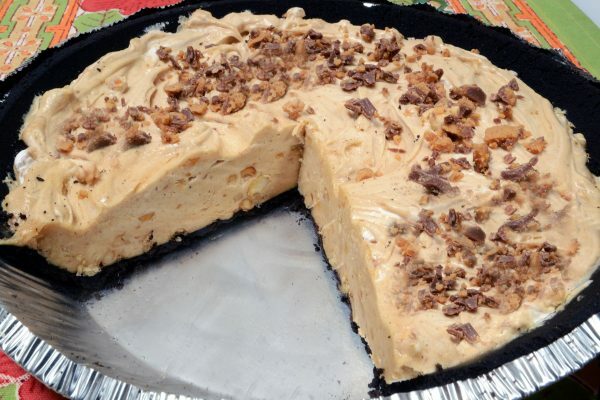 This 4-ingredient Peanut Butter Pie is frozen fun in a pie shell. The creation of it came together quite by accident. Recently, on vacation (when antiquing is a must), I came across an entirely hand-written recipe book called Rose’s Rotary Recipes. The title page simply said District 545. No city, no town, no state. A little research revealed that District 545 was reclassified in 1987 as District 5450 located in North Eastern Colorado. So now we know Rose’s home base. Anyway, Rose’s Rotary Recipes is loaded with many of the potluck favorites of days gone by. In the dessert section, I came across Peanut Butter Pie that called for 8 ounces of cream cheese, 2 cups of powdered sugar, peanut butter, milk, cool whip, and a graham cracker crust. Would Rose mind if I altered the recipe, since I didn’t have cream cheese or milk? I decided to give it a try with an Oreo Chocolate ready-made pie shell instead of the graham cracker crust and was overjoyed at the results. Since I didn’t use cream cheese, there was no need for 2 cups of powdered sugar, so I reduced it to one tablespoon. Because the pie only took about 5 minutes to make, I decided to make a cherry pie version using the same method. It’s now one of my favorite quick and easy treats and definitely a crowd pleaser. In a bowl, gently stir together the peanut butter, Cool Whip, and powdered sugar until well blended. Pour into pie shell. Top with chunks of Reese’s Peanut Butter Cups, if desired. Freeze for 8 hours or overnight. Then, just bring it right out of the freezer and slice it up. It will thaw pretty quickly right on the plate, but it's meant to be eaten as sort of an ice cream pie! Be prepared to get hooked! Substitute one 20 oz can of Comstock Lite Cherry Pie Filling for the peanut butter and substitute a graham cracker crust (9 inch shell or mini shells) for the chocolate pie shell. Exclude peanut butter cups. Follow same directions as 4-Ingredient Peanut Butter Pie. Fold all ingredients (except the pie shell) together and pour into pie shell. Chill. Can be frozen.